Located in the immediate vicinity of Geneva Airport and the Palexpo Exposition Centre, this 3-star family hotel offers a free shuttle to the airport and Palexpo (on request). Only 50 metres from a bus stop and 15 min from the Cornavin Railway Station in Geneva’s city centre, the hotel’s location makes it an ideal choice for business travellers and holidaymakers alike. 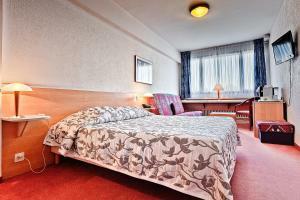 The hotel offers 25 comfortable rooms and a relaxing, friendly atmosphere. Free wireless LAN internet access, a computer and a printer are available in the reception area.